An Enhanced Rule-Based Web Scanner Based on Similarity Score, LEE, M., LEE, Y., YOON, H.
K-Linkage: A New Agglomerative Approach for Hierarchical Clustering, YILDIRIM, P., BIRANT, D.
In a random deployment or uniform deployment strategy, sensor nodes are scattered randomly or uniformly in the sensing field, respectively. Hence, the coverage ratio cannot be guaranteed. The coverage ratio of uniform deployment, in general, is larger than that of the random deployment strategy. However, a random deployment or uniform deployment strategy may cause unbalanced traffic pattern in wireless sensor networks (WSNs). Therefore, cluster heads (CHs) around the sink have larger loads than those farther away from the sink. That is, CHs close to the sink exhaust their energy earlier. In order to overcome the above problem, we propose a Hexagon-based Intelligent Grouping approacH in WSNs (called HIGH). The coverage, energy consumption and data routing issues are well investigated and taken into consideration in the proposed HIGH scheme. The simulation results validate our theoretical analysis and show that the proposed HIGH scheme achieves a satisfactory coverage ratio, balances the energy consumption among sensor nodes, and extends network lifetime significantly. K. Shi, H. Chen and Yao Lin, "Probabilistic coverage based sensor scheduling for target tracking sensor networks," Information Sciences, vol. 292, no. 20, pp. 95-110, Jan. 2015. 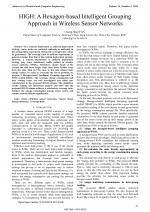 W. Fang, S. Li, X. Liang and Z. Li, "Cluster-based data gathering in long-strip wireless sensor networks," Advances in Electrical and Computer Engineering, vol. 12, no. 1, pp. 3-8, Feb. 2012. M. S. Familiar, J. F. Martinez, I. Corredor and C.G.-Rubio, "Building service-oriented smart infrastructures over wireless ad hoc sensor networks: A middleware perspective," Computer Networks, vol. 56, no. 4, pp.1303-1328, Mar. 2012. E. I. Gokce, A. K. Shrivastava, J. J. Cho and Y. Ding, "Decision fusion from heterogeneous sensors in surveillance sensor systems," IEEE Trans. Automation Science and Engineering, vol. 8, no. 1, pp. 228-233, Jan. 2011. Y. Wang, Q. Zhao, D. Zheng, X. Guan, "On optimisation of cluster-based sensor network tracking system," Int. J. of Ad Hoc and Ubiquitous Computing, vol. 14, no. 3, pp. 145-157, 2013. R. Jiang, J. Luo and X. Wang, "HRKT: A hierarchical route key tree based group key management for wireless sensor networks," KSII Trans. on Internet and Information Systems, vol. 7, no. 8, pp. 2042-2060, Aug. 2013. M. R. Senouci, A. Mellouk, A. Aissani, "Random deployment of wireless sensor networks: a survey and approach," Int. J. of Ad Hoc and Ubiquitous Computing, vol. 15, no. 1/2/3, pp. 133-146, 2014. A. Liu, X. Jin, G. Cui and Z. Chen, "Deployment guidelines for achieving maximum lifetime and avoiding energy holes in sensor network," Information Sciences, vol. 230, no. 1, pp. 197-226, May 2013. J. Jia, X. Wu, J. Chen, X. Wang, "An autonomous redeployment algorithm for line barrier coverage of mobile sensor networks," Int. J. of Ad Hoc and Ubiquitous Computing, vol. 16, no. 1, pp. 58-69, 2014. Y. Taniguchi, T. Kitani and K. Leibnitz, "A uniform airdrop deployment method for large-scale wireless sensor networks," Int. J. of Sensor Networks, vol. 9, no. 3/4, pp. 182-191, May 2011. T. E. Cheng, R. Bajcsy, "Congestion control and fairness for many-to-one routing in sensor networks," Proc. of the 2nd ACM Conf. on Embedded Networked Sensor Systems (SenSys), pp. 148-161, Nov. 2004. M. Won, H. Ra, T. Park and S. H. Son, "Modeling random deployment in wireless sensor networks for infrastructure-less cyber physical systems," The 2nd IEEE Int. Conf. on Cyber-Physical Systems, Networks, and Applications, pp. 81-86, Aug. 2014. K. B. Khajeh, M. A. J. Jamali and H. M. Manie, "ACDS: Adaptive topology construction for r-random sensor deployment in wireless sensor networks," 12th ACIS Int. Conf. on Software Engineering, Artificial Intelligence, Networking and Parallel/Distributed Computing, pp. 139-144, Jul. 2011. N. Kulkarni, R. Prasad, H. Cornean and N. Gupta, "Performance evaluation of AODV, DSDV and DSR for quasi random deployment of sensor nodes in wireless sensor networks," Int. Conf. on Devices and Communications (ICDeCom), pp. 1-5, Feb. 2011. P. Balister and S. Kumar, "Random vs. deterministic deployment of sensors in the presence of failures and placement errors," IEEE Int. Conf. on Computer Communications (INFOCOM), pp. 2896-2900, Apr. 2009. Y. R. Tsai, "Sensing coverage for randomly distributed wireless sensor networks in shadowed environments," IEEE Trans. on Vehicular Technology, pp. 556-564, Jan. 2008. M. R. Senouci, A. Mellouk, L. Oukhellou and A. Aissani, "Uncertainty-aware sensor network deployment," IEEE Global Telecommunications Conf. (GLOBECOM), pp. 1-5, Dec. 2011. S. He, X. Gong, J. Zhang, J. Chen and Y. Sun, "Curve-based deployment for barrier coverage in wireless sensor networks," IEEE Trans. Wireless Communications, vol. 13, no. 2, pp. 724-735, Feb. 2014. M. Eftekhari, L. Narayanan and J. Opatrny, "On multi-round sensor deployment for barrier coverage," IEEE 10th Int. Conf. on Mobile Ad-Hoc and Sensor Systems (MASS), pp. 310-318, Oct. 2013. Y. Yoon and Y. H. Kim, "An efficient genetic algorithm for maximum coverage deployment in wireless sensor networks," IEEE Trans. on Cybernetics, vol. 43, no. 5, pp. 1473-1483, Oct. 2013. G. Chen, S. K. Das and X. Wu, "Avoiding energy holes in wireless sensor networks with nonuniform node distribution," IEEE Trans. on Parallel and Distrib. Systems, vol.19, no.5, pp.710-720, May 2008. W. K. Lai, C. S. Fan, and L. Y. Lin, "Arranging cluster sizes and transmission ranges for wireless sensor networks," Information Sciences, vol. 183, no. 1, pp. 117-131, Jan. 2012. W. R. Heinzelman, A. Chandrakasan and H. Balakrishnan, "An application-specific protocol architecture for wireless microsensor networks," IEEE Trans. on Wireless Communications, vol. 1, no. 4, pp. 660-670, Oct. 2002. H. Shen, "Finding the k most vital edges with respect to minimum spanning tree," Proc. IEEE National on Aerospace and Electronics Conf. (NAECON), vol. 1, pp. 255-262, July 1997. 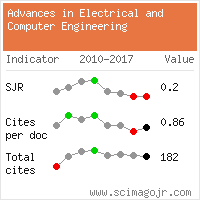 Citations for references updated on 2019-04-22 00:56 in 166 seconds. Website conception, design and maintenance by Eugen COCA. Content updated on 28 Feb 2019. Site engine updated on 28 Feb 2019. This page was generated on the server in 0.092 seconds and loaded in your browser in > seconds.